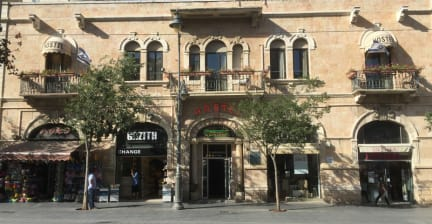 Welcome to The Jerusalem Hostel and Guest House, right in the heart of Jerusalem! We have taken a charming historic two star hotel and turned it into a modern, young, clean hostel in the best location in West Jerusalem. 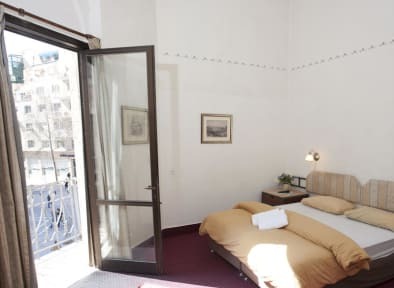 The Hostel is located in middle of everything - sights, markets, shopping and night life. You won't have to navigate your way through the dark alleys of the Old City at the end of the day (just note that everything closes down tn The Old City after sunset). It's truely a 5 star hostel. We offer single, double and group/family rooms and dorm beds for very reasonable prices . All our rooms have attached showers and toilets. You can enjoy a street level lobby, a huge roof and a modern kitchen and dinning room. The Atmosphere here is very nice, much more personal and friendly than the big ones! One of the best hostels I have been to! Only thing I really didn’t like, is that I was woken up after falling asleep for 5 minutes living room in a very unfriendly way. Asking why got me the answer “this is a living room, not a dormitory”. I see why they don’t want people to sleep there at night - but this? Very uncool and uncomfortable. They should rethink that rule and be nicer about it to their guests! Atmosphäre ist wunderbar, viel besser als in den bekannten Abra...Hostels. Frühstück ausreichend und Ländertypisch. Betten sehr wackelig, man fühlt sich wie in einem Boot. Decken dreckig, dünn, in meiner waren Läuse, habe am ganzen Körper brennende & juckende Stiche/Wunden gehabt danach. Boden Teppich alt dreckig. Hostel sehr gemütlich aber klein. Bad tgl geputzt aber alt und rennovierungsbedürftig. Personal hilfsbereit, nett, liebevoll. Lage ausgezeichnet. Würde trotz Läusen wieder kommen. The staff was real nice, but the place is soooo dirty. We didn‘t even want to step inside the bathroom :( really sad because there is so much potencial and pls bring your cat to a vet!! !